We are manufacturing a wide range of Plastic Fridge Bottles. Manufactured using high-grade raw material, these bottles are developed as per the set industry standards and norms. Our offered bottles are used to store water, fruit juice and other liquid. 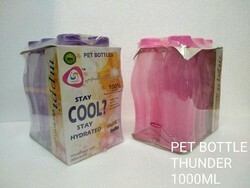 Clients can avail these bottles in small, medium and large sizes as per their exact requirement. - A handy designed bottle 100% leak proof, can be carried anywhere. - The outer glossy finish of copper makes it a beautiful looking item. Our company has achieved laurels in offering Polo Fridge Bottle to the clients. Offered range is available in different sizes, dimensions and other specifications to suit clients' variegated requirements and gain optimum satisfaction. This is fridge bottle with unique design.it is totally BFA free product.